Figure 1. Adult male mountain goat on winter range in the Chilkat Valley, near Haines. This photo was taken with a remote camera. Previous research has demonstrated that mountain goats are particularly sensitive to disturbance associated with helicopter over-flights, such as that associated with summer and winter helicopter tourism. 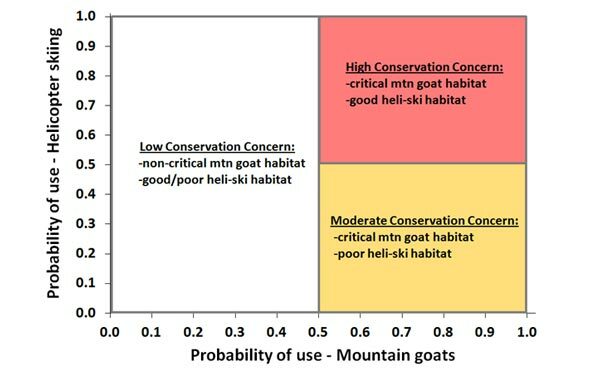 As a result, land management agencies regulate helicopter tourism activities in mountain goat habitat by requiring helicopters to stay at least 1500 meters away from mountain goat habitat, particularly at critical times of the year (i.e. winter, kidding season). However, a significant challenge for land managers is determining where mountain goat habitat occurs across large portions of the landscape. In the Haines and Skagway areas helicopter tourism is a significant and growing activity and precise delineation of critical mountain goat habitat is needed in order to help resolve resource management issues and ensure that local mountain goat populations are not adversely effected by industrial tourism activities. In partnership with the Bureau of Land Management, a mountain goat research project was initiated in order to gather mountain goat resource selection and population ecology data in the Haines-Skagway area. Specifically, 48 mountain goats have been deployed with GPS radio-collars programmed to collect a geographic position (latitude/longitude) every 3-6 hours. Mountain goat locations will be combined with remote sensing data in a geographic information systems (GIS) framework in order to produce statistically robust resource selection function (RSF) models. These models will then be used to map important seasonal mountain goat habitat and can be interfaced with helicopter tourism use areas to identify areas of conservation priority and assist with land management decisions. The Haines-Skagway area is an interesting place to study seasonal habitat selection patterns of mountain goats because the area is geographically situated in a climatic transition zone between the coast and interior regions. 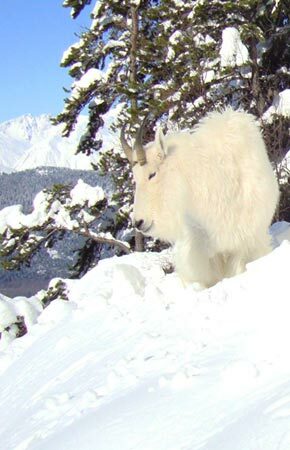 In most parts of coastal Alaska, mountain goats winter in low elevation forested areas in order to escape the deep snowfall that occurs in the alpine (up to 12 feet). However, in interior climates winter conditions are colder and drier and alpine zones accumulate much less snow resulting in ridges being windblown and devoid of significant snow. Thus, in interior climates mountain goats winter at high elevations, and do not descend to low elevations during winter. Consequently, in the Haines-Skagway area local variation in climate results in mountain goats wintering at low elevations in some areas (i.e. near the coast) and high elevations in other areas (i.e. upper reaches of large river valleys). 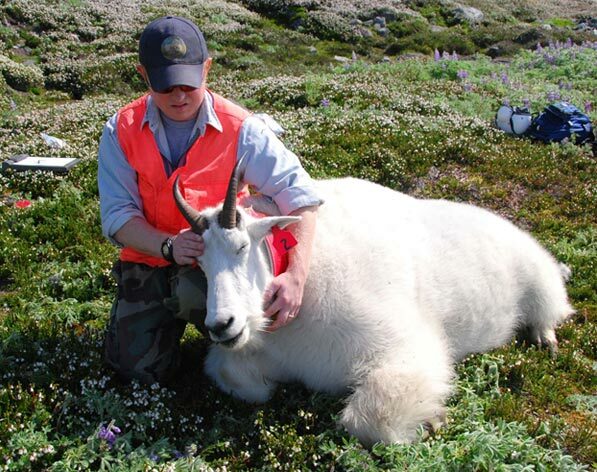 Correctly determining mountain goat winter range in the Haines-Skagway area requires GPS radio-marking mountain goats in a systematic manner across a range of different geographic areas. Identifying high elevation winter ranges is particularly relevant to helicopter skiing management because such areas have the greatest potential for overlap. Yet, it is also important to identify areas where mountain goats winter at low elevation so that helicopter skiing activities are not inappropriately regulated. White, K. S., A. Crupi, R. Scott and B. Seppi. 2012. Mountain goat movement patterns and population monitoring in the Haines-Skagway area. Research progress report. Alaska Department of Fish and Game, Juneau, AK. Figure 2. Map of the Haines-Skagway mountain goat study area. Mountain goat capture locations and areas designated for summer and winter helicopter tourism are described. Figure 3. 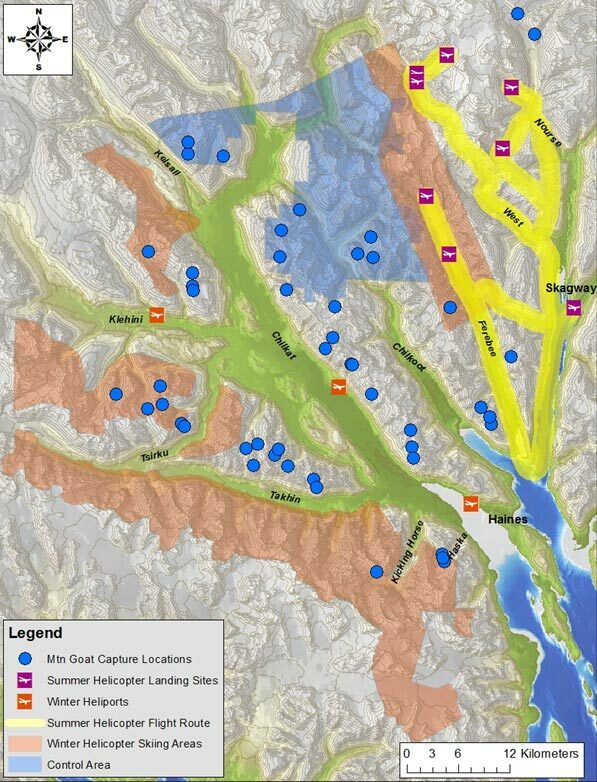 Land management decision framework intended to be used to assess mountain goat-helicopter skiing priorities in the Haines-Skagway area. Data collected from mountain goat GPS radio-collars will be used to identify critical winter habitat. Figure 4. Wildlife biologist, Ryan Scott, handling an immobilized adult male mountain goat to deploy a GPS radio-collar. The mountain goat weighed 385 lbs in early August; the largest mountain goat weighed in Alaska to date.